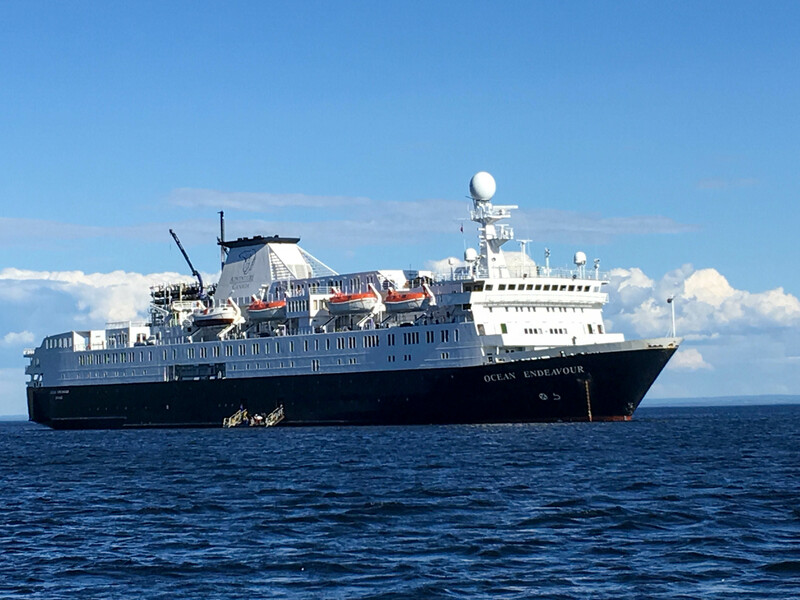 Adventure Canada’s expedition on the Mighty Saint Lawrence is listed as one of National Geographic’s Top 50 Trips of a Lifetime. The journey begins in Quebec City, BC, and ends in St. John’s, Newfoundland ten days later. The expedition team travels up the St. Lawrence River stopping at various places along the way seeking out wildlife and adventure. Selected as a member of the media team, as a freelance travel writer from Portland, Oregon, I found myself giddy with anticipation awaiting the trip. 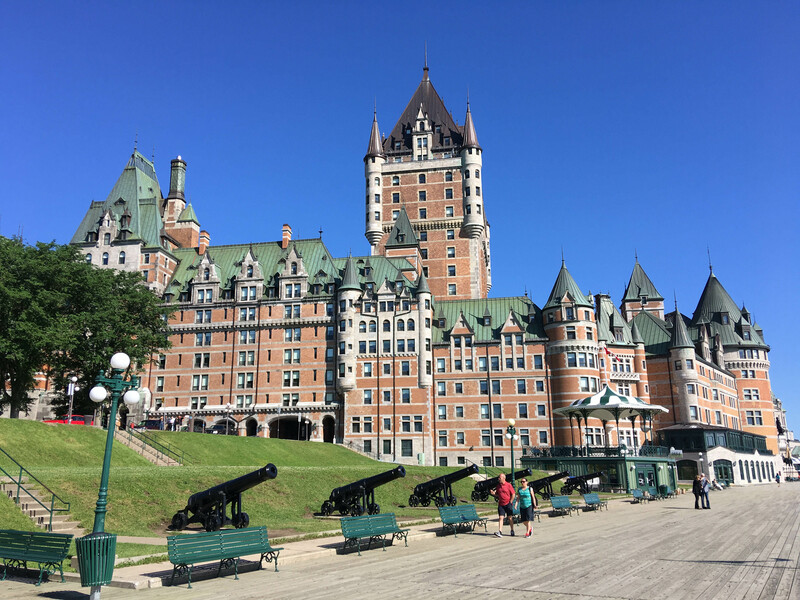 After arriving in Quebec City and taxiing to the Chateau Frontenac, I headed out for a walk and dinner. Although it was 9:00 pm in this city, my internal clock registered 6:00pm PST. The city lights glowed and the locals and visitors bustled about on the warm Saturday night. The music from street musicians filled the evening air and infused it with a sense of festivity. Quebec City rests on the Saint Lawrence River in Quebec province, one of Canada’s predominantly French-speaking areas. The muted gray-colored stone buildings and narrow streets date back to 1608. The quartier Petit Champlain, a lovely old neighborhood, is located in the district of Vieux-Quebec, the oldest commercial district in North America. Situated along the Saint Lawrence River, the narrow streets are afire with live entertainment, bistros and boutique shops. 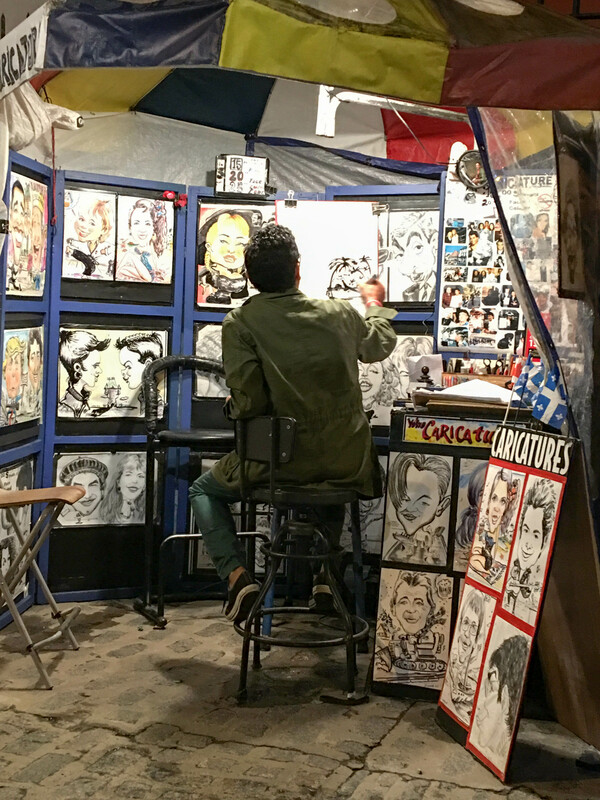 Wandering about I discovered different style eateries, street venders, and cartoonists. The scent of garlic and onions emanating from the Brasserie Chez Jules drew me in. 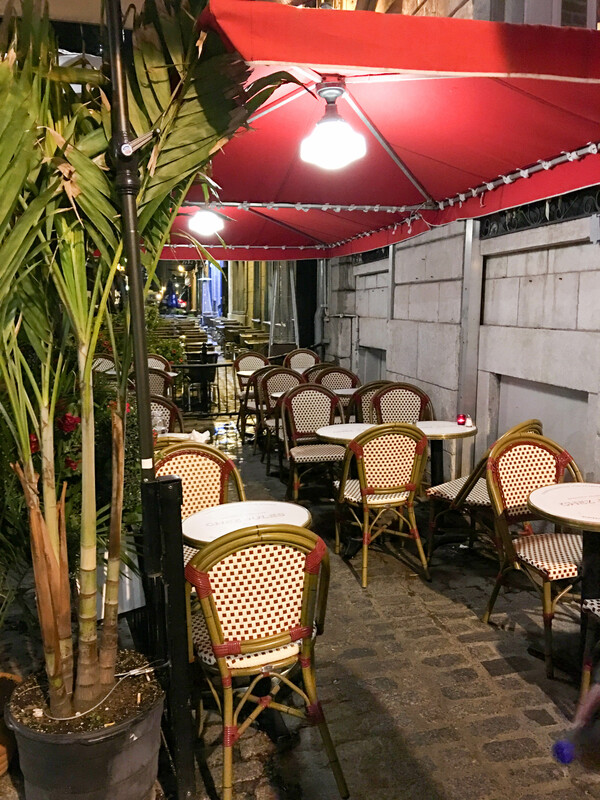 The tiny patio, red canopy, wicker chairs, and palm trees dancing in the light breeze sent my mind reeling back to moments from my latest trip to Paris. The little brasserie sat adjacent to the park on a little alleyway made of cobblestone. A family of four sat at one of the inner tables. The maître dee handed me a menu and seated me next to the alley. I perused the list, deciding what delicacies I would partake of while listening to the French spoken at the table just a few feet away. The rhythm of the language lulled me into a spirit of traveler’s contentment, and I was startled when I looked up to find the waiter poised to take my order. 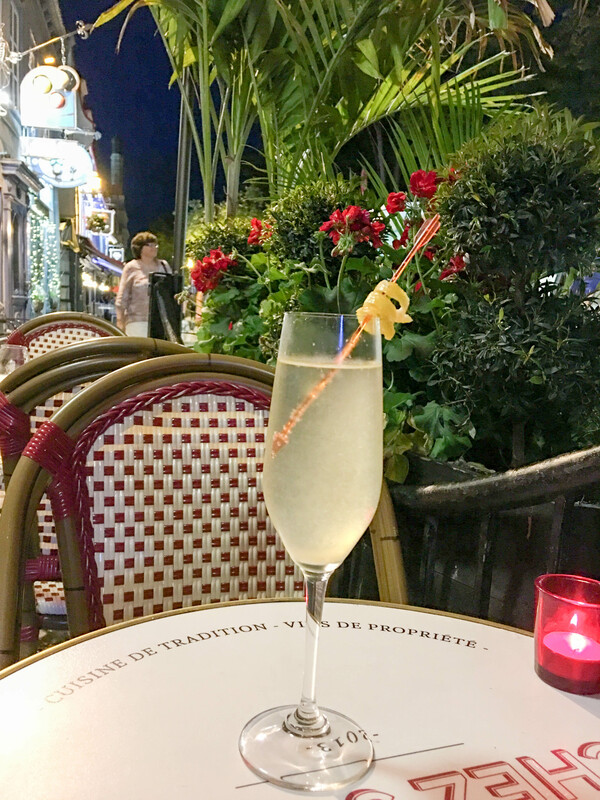 The French 75 is a cocktail made with gin, syrup, and lemon juice, typically shaken with ice, and then poured into a fluted glass and topped with Champagne. This drink is the perfect beginning to an evening out in the most French-speaking part of Canada. 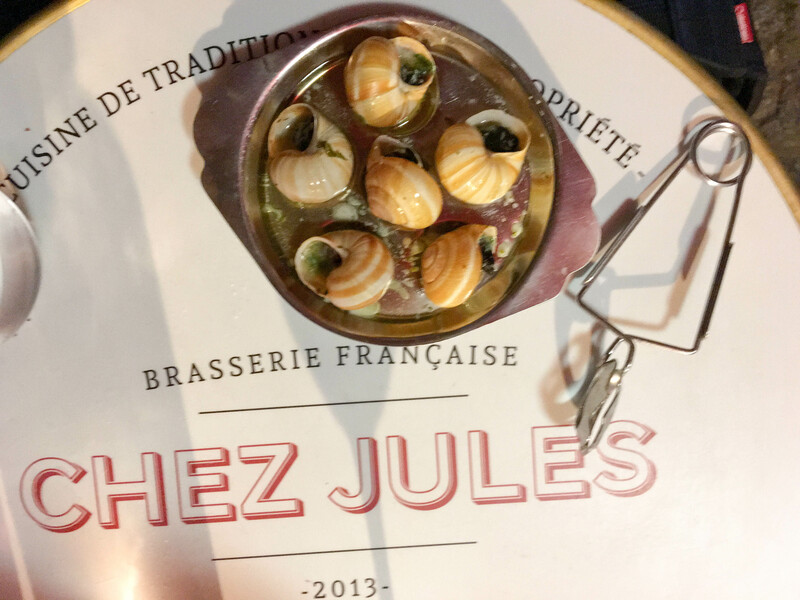 For my first course I ordered Burgundy Escargots in Shells, snails swimming in garlic and parsley butter. The snails were delicious, although dunking chunks of bread into the seasoned butter was the most delectable encounter for me. 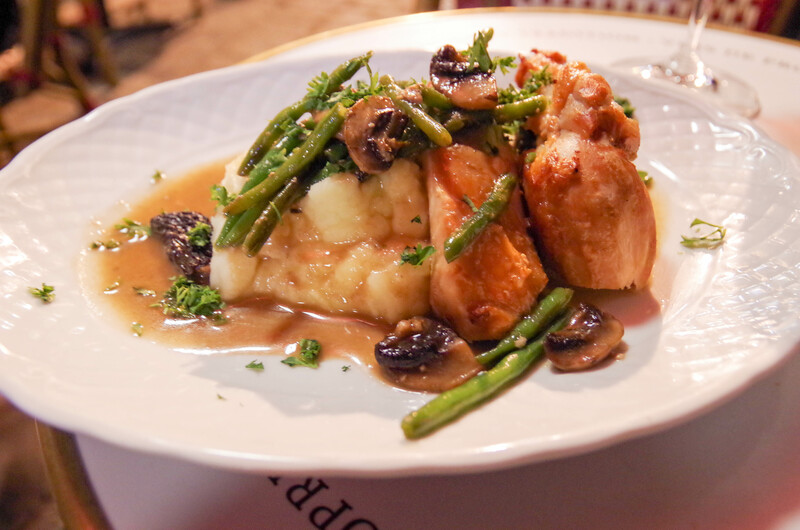 For the entrée, I could not pass up Juna’s specialty, Coq Au Vin Jaune, tender pieces of pounded chicken in a savory sauce with morel and button mushrooms over silky mashed potatoes. Pairing the dish with a glass of Pinot Noir, while sitting outside in the warm late-night air once again evoked fond memories of the late-night dinners I experienced in Paris with my daughter, Brittney. I finished the meal with chocolate mousse and shortbread cookies. Full, and completely satisfied, I ventured back in the dark to my room at the Chateau Frontenac. Morning came quickly. After spending time rearranging my luggage, I headed outside to examine the city in daylight. Wandering the streets, I soon found myself down by the river. I meandered a bit and took a few photos, then eventually moved into the side streets surrounding the hotel. I settled in at La Buche Cuisine Quebecoise. It was time for breakfast, so I ordered the Poutine Dejeuner, or in English, poutine of the day, paired with a refreshing mimosa. Poutine is a traditional Canadian dish from the Quebec province. It is typically made with french fries, cheese curds, and then topped with light-brown gravy. 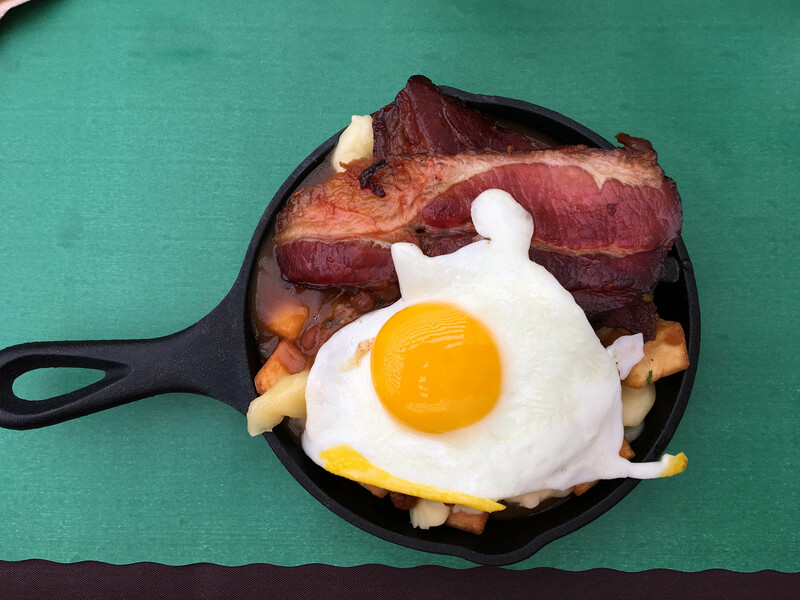 This dish was similar but with the addition of beans, thick-cut bacon, and a bright-yellow fried egg on top. It was delicious, but rich, leaving me no choice but to sadly leave a large portion on my plate. I finished my mimosa, paid the bill, and retreated to the hotel to meet the group. This was the beginning of my trip, leaving the security of my home in Vancouver, Washington, near Portland, Oregon, and venturing out on an expedition on the Mighty Saint Lawrence River.